This Tuesday has been eight hours longer than last Tuesday. I am currently experiencing 5pm for the second time today - only this time it's 113 degrees outside. 1. Go rafting. There may be white water involved. 2. NOT have to run away from bears. 3. Have a nice anniversary meal out with Mr Z (we have been married for three years today). 4. Swim in Lake Tahoe. 5. Visit Jimmy Beans in Reno. 6. Go on a hike for longer than an hour (and try not to whinge about it). This will help me to truly appreciate Yosemite at its most beautiful. I hope. 7. Visit the Donner Memorial - the story behind which I teach every year - and surreptitiously shoot a photo story re-enactment for use in class next year, without being thrown out/causing an international incident. 8. Get a pedicure. You're probably sick of reading me write that by now. 9. Get a nice tan - or at least, not burn. 10. Fill up a memory card with photographs. There may be some blogging on the way round. I have it in mind to do a video diary on my camera and upload it when I get the chance, so it may be me talking. As long as I don't get attacked by a bear. 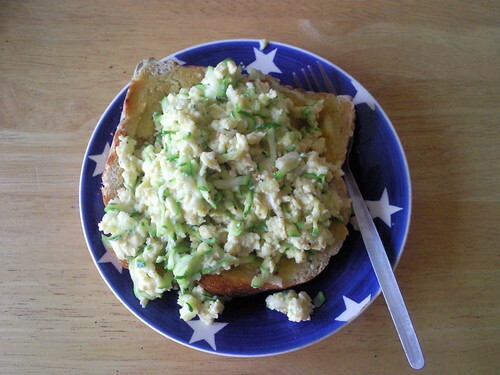 Time has been against me this week, and I've barely eaten any meals at home, so yesterday I hoofed it to the local farm shop, Turners, and picked up some eggs and butter and bread from Hobbs House bakery and made this very simple lunch of scrambled eggs with grated courgettes (from the garden) on toast. I love adding veggies to scrambled egg, though usually it's just tomatoes. I also bought some local flour and I have some rhubarb from a knitting group friend's garden and I was going to make a cake, but I think I have run out of time and will not have time to eat it, so perhaps I will just stew the rhubarb and freeze it for when we come back. Excited as I am about the Odyssey 2009, I am a little sad to be leaving my prolific courgette plant and the tomato plants, which are heavy with gigantic green tomatoes. In spite of the fact they are supposed to be cherry or plum I think we have quite a lot of beefsteak on our hands. Hopefully the Parents Z will pick them as they redden and leave them in the fridge for our return, since home grown veg always seems to keep extremely well. I am a little perplexed as to how to do local meals over the next three weeks, what with being on the road and all. I will still be cooking, I suppose, and since we're in California there shouldn't be a shortage of local produce - it's just finding out whether any of it is sold close to where we will be. I will have to keep my eyes peeled. School broke up yesterday. I went out straight from school to celebrate with the rest of the staff, fully intending to last the distance, but I was so tired I was home by 9pm - and then when I sat down I realised how tired I actually was and had to retire without making my FF post. 1. SKI TRIP! It was absolutely awesome this year. Best ever. Great staff, great kids, great snow, really quiet, amazing skiing. And we all had matching hoodies, which made it just that little bit more special. 2. Prague trip, in November. Another amazing visit, even if we did do so much walking my ankles swelled up. I bought some beautiful garnet jewellery and took about a million pictures. We saw a concentration camp, a glass blowing factory (with the men in shorts and sandals smoking and drinking beer at 10am whilst plucking balls of molten glass out of the vat), the massive Skoda factory and traditional Czech dancing, among other things. I really hope we get enough takers for the proposed Berlin trip this autumn. 3. Crystal Maze weekend. This was the first year I had planned and run it - it was in answer to the older clever kids demanding an enrichment weekend for them like the Murder Mystery. 17 students and 10 staff (how I swung that is anybody's guess), the weekend before Christmas; it rained most of the time; we hunkered down inside the centre and played games and had a talent show, and ate everything we were given. It's so nice at that time of year to be away with nice kids who take very little looking after, and not have to worry about cooking or cleaning. 4. My year 11 class. They were really fun. For the first time ever we set the History groups last year and I had a middle ability set. In year 10 they were much quieter and took a lot more chivvying up and encouragement than a mixed ability group - but by year 11 they had their confidence and I really looked forward to, and enjoyed, their lessons. They would work in silence without prompting, but they had plenty to say in discussion. I am crossing my fingers they all get some nice results. 5. Teaching the Totalitarian Ideologies course to year 12. It was exhilirating to go back to teaching something I was so familiar with and I really enjoyed it, even though we massively overran and didn't finish the course properly. It was also interesting teaching a class of 15 boys and 3 girls - I had to do a lot more hands-on stuff with them. Unfortunately for me, my excitement about teaching an International Relations unit next year has had to be put on hold, because the exam board gave us the wrong information at their launch meeting (a YEAR ago) and so we've had to hastily change the program of study for the A-level. Now I'm teaching a coursework unit on American Foreign Policy 1898-present day. It's a bit Cold War-y, but none of the stuff on Yugoslavia that I was so looking forward to - and I will have to mark coursework. BOO. Oh well. It's the first day of the holidays - I really should not be whinging about next year already! 3 days until we fly away! Fave Fridays is all Kelli's idea. This week she's been blogging about her favourite web haunts and she seems as addicted as me! She also has some good giveaways over there. 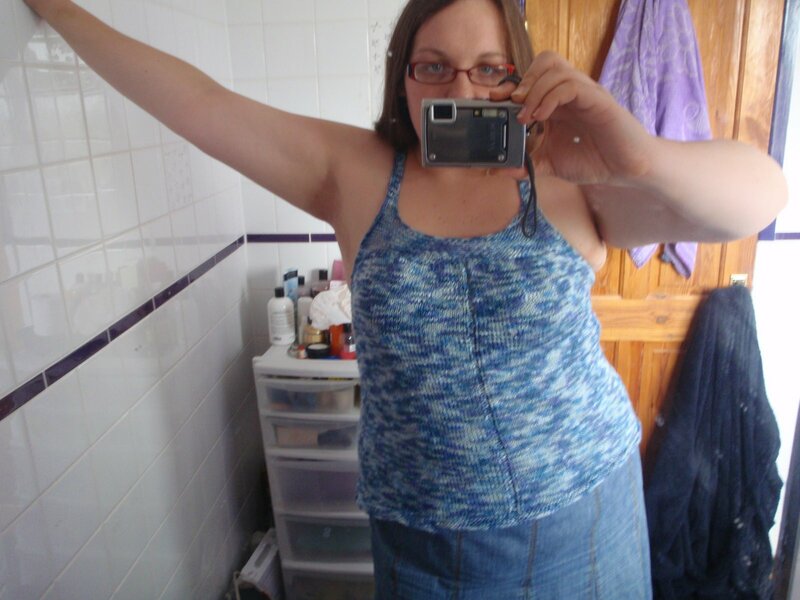 I was talking to one of my work friends about knitting today, and she said, "I LOVE your blue vest top...you know...the blue one, that's like a vest...."
I just nodded and thanked her, unsure of which garment she meant. 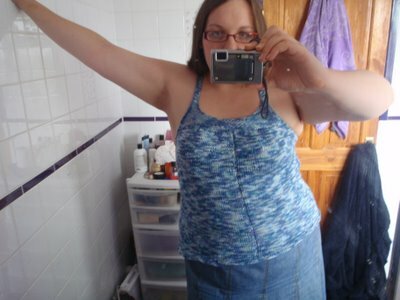 She's not to know that I have at least three blue vest tops in my FO list. I think maybe it's time to branch out a little in my colour choices. "I carried a watermelon" got mega compliments all day today, from everybody who saw it - especially the kids. I may start teaching knitting at school next year as an after school club - I think I'd get some takers. One boy told me about how his mum knits constantly, and will make jumpers on her knitting machine and then hand knit the sleeves. I said, "Oh, does she make you wear all sorts of dodgy things?" to which he replied, "No way, they're amazing! She did me one that says Skate Or Die on it, and they're well warm in the winter - really snug." The times are definitely a'changing. 1. Lots of 'slebs died. Michael Jackson, Farrah Fawcett, Molly Sugden, Henry Allingham (the oldest man in the world, a WW1 vet). 2. Everybody wanted to commute home from work by waterslide. 3. Katie "Jordan" Price and Peter Andre broke up, and I was sad. Their relationship didn't seem to be a sham and I thought they would stick it out. But, marriage is hard...so I hear. 4. Slumdog Millionaire won about a million awards, including a big pile of Oscars. 5. Several artists had number ones by working with dance musicians, like Dizzee Rascal and Kelly Rowland. (Though, I have to admit they both did this last year to some degree of success, and actually I prefer this Dizzee Rascal (perhaps because I have a minor obsession with Calvin Harris) and this Kelly Rowland). 6. Take That did a load of comeback gigs and I really felt my age because it seemed like most of my friends on facebook had status updates about going to one of them. 7. It turned out that Andy Coulson, who is a bigwig adviser to the Tories, was the editor of the News of the World when they were illegally hacking into the mobile phones of the rich and famous in order to sell newspapers. Sadly, I fear this scandal won't be enough to save Labour next year. 8. Harry Potter & the Half Blood Prince finally came out. I, along with many other Ravelers, spent a lot of time discussing the knitwear in it. I also resolved to take teaching tips from Snape for next year. 9. There was a really long, drawn out business about MP's expenses, as some of them paid for duck houses and moat cleaning. As if by magic, everybody's expenses seemed to be under the microscope, including people from the BBC. I felt smug when I went to my exam board meeting and bussed it across London in the midst of a tube strike, instead of getting a cab...but then expensed a glass of wine with dinner. So I'm as bad as everybody else. 10. There was an earthquake in Italy, while we were there with the ski trip. Thankfully it happened miles away from where we were. The incorrigible Berlusconi toured the refugees in their camp, remarking that it must be like going on a camping holiday. Here are some other cringeworthy Berlusconi moments. And an extra one - I was flicking back through my Facebook links and found this, where T-Mobile used flash mobs for advertising, which I thought was amazin'. ONE WEEK UNTIL THE HOLIDAY! I am SO happy with how well those beads work as seeds. Unfortunately they are drilled across the top instead of through the length, so I had to attach them to the bag with fabric glue - but since I already had some, and since I tested one out and had to use some major force to make it budge, I was not too concerned. Those two hours I spent browsing for beads online were totally worth it. It has had a couple of outings now. It is a good size for purse, phone, keys, sunglasses, water bottle and small/medium knitting project. This makes it the perfect bag for practically every occasion. This might be the perfect dress to go with the bag, too. 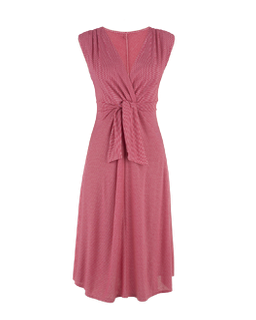 I have been sadly drawn in by Phase 8, who seem to be a slightly fancier version of Boden, who made most of my favourite dresses. Phase 8, however, muscled in and made my fabulous stripey sailor dress which has been this summer's event frock. Phase 8 have also got my email address now, and they keep sending me spoilers about their new lines. It's relentless. OK, so I have to go and fish them out of my spamhilator but still...they sent them in the first place. I am but a weak and feeble woman. I can't resist a pretty dress. 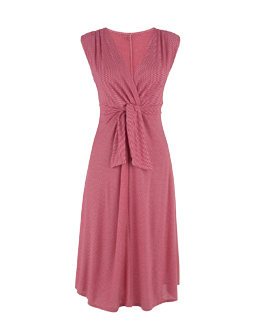 Holidays are in a week, though, and I want to order some yarn from Knitpicks (especially this kit...bet you can't guess which colours) since I'll be in the US to fetch it home, and I have already promised myself this dress from Boden for the autumn. It has, arguably, a more autumnal feel to it. It's a terrible time of year for me, this. The exam board money comes rolling in, most of it already accounted for somewhere, and all I want to do is shop. Welcome to the Great British summer. This picture was just taken. The water on the paving slabs is roughly a cm deep. This is because the twit who owned the house before us laid plastic sheeting under the slabs, to stop weeds growing through. As you can see (because I have a pathological fear of the strimmer), this has not worked - but it HAS prevented correct drainage! What a clever guy. It has been raining for about 24 hours, on and off, but we just had a particularly heavy spell. 1. You don't have to water the plants too often. There's always a downpour nearby. 2. After it rains, everything gets so very green, and plants flourish. Witness: my monstrous courgette plant, which you can make out in the top left portion of the picture. Also, the tomato plants, which are heavily laden with big tomatoes. 3. Barbecues. The Z-Bunny Mansion barbecue is half an oil drum, so it takes a lot of charcoal to get it going, but it's totally worth it. We try and barbecue often when it's sunny. I kind of want a gas barbecue to make it easier but ... actually as I write this I can imagine the evil look Mr Z would be giving me were he here, and I don't feel the need to explain that "but" anymore. 4. It's rarely TOO hot. It was TOO hot in the week of my operation, but only for a day or two. I think that's the first TOO hot time since 2006. 5. Hammock time. Do, do-do-do, doo doo do! Hammock time. You can see the hammock. I've talked about the hammock before. I haven't had much hammock time this summer, so I am hoping for a fine weekend and maybe a few fine days in the summer holidays. With thanks to Kelli, as always. This week her Fave Friday is all about her vacation, which has got me all excited about mine, which is now ONLY TEN DAYS AWAY! I asked some of my pupils on Tuesday if they thought it was too early to start packing. The boys said yes. The girls said no. Big surprise, there. This morning, I used my (hopefully) last day of quarantine to buy travel insurance (I got the enhanced kind to cover high altitude walking, white water rafting, parascending, zip-wire, mountain biking and kayaking...I hope I can cover at least half of the list) and to book a fancy motel for our first night. I got a recommendation from a bizarre source - more on that shortly - for a motel in Visalia and when I went and looked it up it has a hot tub and is walking distance from the centre of town and all good restaurants and bars. I went for it. It can be our wedding anniversary celebration, and our last night of luxury before spending 10 nights under canvas. Now, the bizarre source. 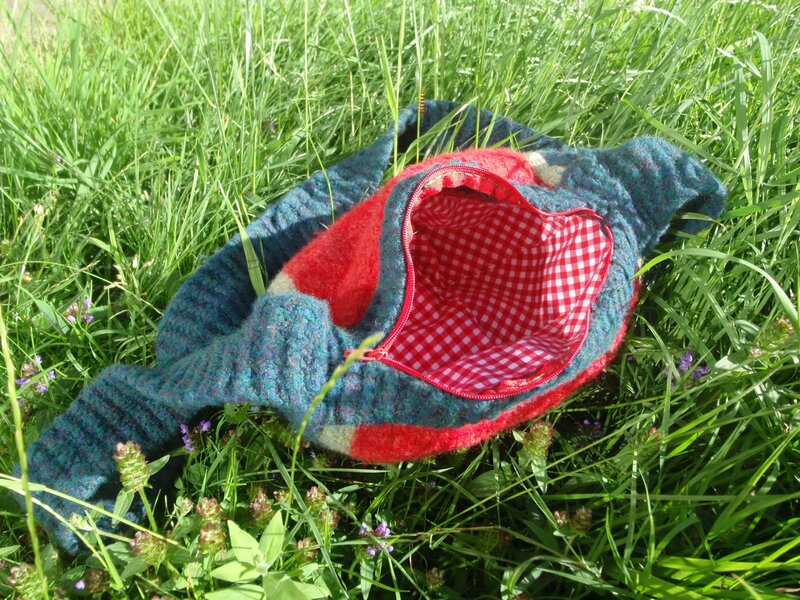 I was browsing the neighbours tab on Ravelry looking for people with similar pattern tastes. This time there was a hit with 36 matches, which is quite high for me. And this person.....lives in Visalia. The coincidence was too great to ignore. So I messaged her and she suggesed the motel I booked. I *heart* Ravelry. The swine flu has abated. I have a slightly stuffy nose and a sore throat not bad enough to warrant paracetemol. The tamiflu is making me feel a bit sick, though. I don't frickin' believe it! So. Recovered from the gall bladder saga, I returned to work on Monday. On Tuesday I woke up with a slightly sore throat. About half an hour after returning from work on Tuesday, I started to feel very dizzy and shivery, slept all evening heaped in blankets and started to have pain swallowing. Yes, that's right. SWINE FLU. FFS! I am SO SICK of being ill! I am a terrible patient. I hate feeling unwell and to have to take the best part of 3 weeks out of work is just killing me - even though there are hardly any lessons to be covered. There's some amazing irony there, that I've been hanging out all year for exam classes to leave so I have all this time and then I end up off sick for most of it. Though, by my count, seven teachers at school have it now (that's way more than kids) so we might end up closed early anyway. Luckily it doesn't seem to be too severe so far. I am feeling slightly better today than I was last night, probably because of the 12 hours of sleep I got. I've started taking Tamiflu. I suppose it's better to get it out of the way now, rather than catching it on the plane to America. I am trying to make Mr Z catch it, but he keeps using this alcohol hand gel stuff so I am going to have to resort to doing something unspeakably disgusting to him while he's asleep. Only joking bun. You hope. I'm terribly lethargic and can't even do much knitting, let alone think of ten things to blog. Hopefully I will make it out to a shop at some point for OLS meal ingredients, otherwise it will be courgettes a la courgette. It has been 3 weeks since I was able to publish details of a weekend FO - what a slacker I have been! However, since being off sick I have a raging case of startitis and a holiday motivating me to finish things so I have almost 2 to share today (you'll see what I mean). Pattern: Frock Camisole by Katie Himmelberg. I bought the copy of Interweave Knits this was in for a lot more than it really cost, as it was a back issue and shipped from the US, but I want to knit about 80% of its patterns and this is the 2nd project I have started out of it, so I feel justified. Yarn: Rowan Damask, in a dark blue mix. Brings out my eyes, apparently. Nearly 5 balls. It's a shame this yarn is discontinued, I love the colourways and it's knitted up lovely and soft, with a good drape. Mods: I knitted the straps in a 1x1 rib so they don't curl, and I attached them to the back with a three needle bind off. It's a gorgeous, light, cool, summer top, and it went superquick - 6 days. It needs blocking, really. I was going to do that today but then I accidentally wore it instead. I was between two sizes and went for the smaller, and then my gauge was about 21st/4in instead of 19, so it has come out clingier than it should have - but after wearing all day it has relaxed out quite nicely. Not TOO much thankfully - it's in no danger of being saggy, thanks mostly, I suspect, to the linen content of the yarn. Pattern: My OWN DESIGN! I am calling it "I carried a watermelon"
It's lined with red gingham and has a red zip along the top. First zip I've ever sewn into a knitted item. I got the lining fabric from the Foam Shop up the 'wood, which has improved slightly from the damp and smelly cave of fabric it was last time I went in - but I still had to wash the fabric before I was able to use it, since it had been on a bottom shelf and smelled a bit mouldy. It wasn't mouldy, thankfully - and it was an absolute bargain at £2.50/m - especially since I got quite a sight more than a metre, it being the end of a roll. I agonised for quite some time about the reds for the watermelon flesh, and what I initially picked out turned out top be superwash (DURRR!) so in the end I used a blend of Flame and Christmas Red which has come out spookily true. I love the dark green - I really love how Cascade Heathers always has a little surprise colour that pops out after felting. This has quite a lot of red in it, so it goes really well. Ooohhh...accidental both weekend FOs in one picture! I thought about the construction of this bag for quite a while and how to make it strong, since I always cram too much into my bags. In the end I knitted the gusset and strap as one really long piece and then attached the watermelon pieces to it before felting, leaving a long strip flapping free, which then became the top panel after felting. Once it was sewn up I cut down the middle of the top panel and stitched in the zip. This way, the structure of the bag relies on the strength of the felting to keep it together, which is bound to be way stronger than my sewing! I ordered some of these beads on Saturday, which will become the pips - so this is why it's not quite a FO yet, but I couldn't wait to share! Mr Z is already planning a good photo shoot for it so there are bound to be more pictures of this around in the future. I am feeling very pleased with myself. 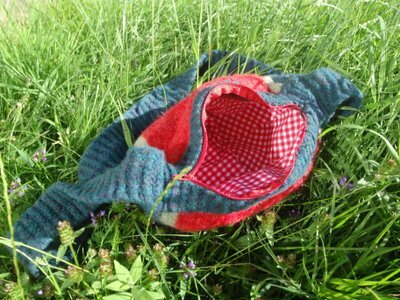 I saw someone carrying a watermelon handbag at the end of May and knew I could knit myself something as good, and I actually have. Check me out! This week I had spicy chorizo-style bangers with courgette and potato rosti - FAR more successful this week as I left out the cheese - and the last of the onion marmalade. I even took a picture but it came out really dark and made everything look burned. I haven't been successful with picture taking yet. The sausages came from my local butcher, who also gave me a bit of an education this week. I've been using the same local butcher for about 5 years now. Shopping separately for meat and green groceries, and only using the supermarket for stuff only they sell, is much more economical and the produce is better quality - fruit and veg that doesn't go off overnight, you could do a stir fry for 2 from one chicken breast, for example. The butcher gets me a ham of a perfect size every Christmas, and they provided all the sliced cold meats for our wedding buffet, and recently a new butcher has taken over in the shop (replacing the miserable old one who could barely raise a smile) and he is grand. He has a limp, a hunch, a lisp and stutter, and is as broadly Bristolian as they come (I may have already mentioned this...I am quite taken with him). I have taken to going in and asking for a joint of meat I can't mess up. He gets it right every time - gives cooking and serving instructions, too. Anyway, enough bigging him up. This week I asked him if the delicious garlicy sausages I buy every month were made on the premises. Turns out, they're made at the sister store in Bedminster, from local pork, which they grind themselves. The eggs they sell are from Dorset, and there are signs up all over the place naming the farms where the meat comes from. It's an interesting paradox. The eggs aren't free range - I don't buy them. The meat is most likely not happy meat. So, it doesn't tick all the boxes I usually associate with ethical eating - but it is local, and supportive of local businesses to buy there. I've seen at least two butchers close down since I moved here, and I think people need somewhere to buy hand made faggots (whatever they are - they're hugely popular), tripe and pigs feet. The supermarkets don't even sell ham bones anymore. That's a lot of waffle. Basically, I am saying - local sausages, right under my nose and I never even knew! So many organic/local/fair trade shops these days spend ages putting up aigns about it that the ones who have been doing these things forever, quietly going about their business, are overlooked. Back to work on Monday. I won't have nearly as much time for navel gazing and waffling then. 1. Babyface cleanser. This stuff is awesome. Sometimes I even use it as a mask in the bath. I particularly love it when people mistake it for soap (there are 4 different bars of soap on the sink, and the Babyface, which is set to the side) and then end up washing their hands for half an hour to get the grease off. 2. Gorgeous moisturiser. The only thing that gets me out of bed at 6am on the first day of the post-Christmas sale - I can stock up a year's worth for a fraction of the price. I think I'd still pay full price for it though, it's amazing stuff. It makes me look like I've had an excellent night's sleep no matter what. 3. Uluru bath bomb. It's discontinued now but I still buy it from the Retro section on the website. It's got a really subtle scent that hangs around for ages after the bath, and it softens the water better than any of their other products. 4. Curly Wurly shampoo. It took me a while to get used to this because the coconut gets stuck in my hair a bit but it always comes out when I condition and my hair is so soft and shiny. And coconutty. I love coconut. 5. King of Skin. I remember when I first bought this as a naive new Lushie - I took it on holiday to Ibiza and I didn't know about using it in the shower and washing off the excess. I smothered my legs in it and sprinkled them with gold haberdashery glitter before we went out to Dave Pearce at Eden, and I looked like an extra from Goldfinger. It was our last night and the barman picked me up for a picture with Jen, and when he put me down he was all, "Ergh! What's all this greasy gold glitter all over my arms?!" 24 was a fabulous age! I still have (and love) those shoes, though they've had to have some cobbler tlc. The heel snapped off them about 90 minutes after this shot was taken and I ended up dancing all night in bare feet. Back to King of Skin....Happily I know better now and use it in the shower. I have dry skin and am terribly lazy about moisturising my legs but this is really easy. Wow, it was hard to pick just five! I don't really go on the Lush forums anymore, but I still love to shop there. I went in today and spent ages looking at the new products. Great fun. Then I had to have a little sit down because I am still off sick and still getting a little breathless - but I am hoping to be right as rain by Monday, so I can go back to work. Getting quite bored now, especially since all the exam board work is as good as over. Just the reports to write now. Thanks to Kelli for her fun Friday meme! It's that time of year agin. This advert is back in the TV. It makes me very happy. 2. Crystal Light. It may be more British to have liquid squash but it's so much more convenient to have it powdered - and nobody does a fake raspberry quite like Kraft. What a pity the dyes are illegal in the UK. 3. Sitting out on the back porch at midnight when it's cool, so that it's only like having a hair dryer in your face instead of sitting in a sauna, sipping Crystal Light and gabbing. 4. The fake garden, beautiful glass ceiling and fancy shops at the Bellagio. I might treat myself to a little birthday present at Tiffany this year. 5. Lazy driving. American cars, tsk - I could be paralysed down my left side and still drive perfectly normally, especially on the massive broad roads (though that turning right on a red light thing really confuses me). Also, though, tarting around in Father Hand's convertible MR2. 6. Pedicures. I love my little local salon, which is a 5 minute walk door to door and has really friendly beauticians who've been working on me for 4 years now, but nothing beats that pedicure I got from the teeny Asian girl chatting on her mobile phone as she shaved the dead skin off my feet. 7. Sephora. Philosophy! And all the make up. Benefit especially. Mmmmmmmm. 8. Cheap petrol. Don't come crying to me that it's $3.20 a gallon or something now. 9. Blizzards from Dairy Queen. Anybody who has only ever had a McFlurry is totally missing out. In fact, Americans do almost all ice cream better - witness, the billion flavours of Ben and Jerry's available. 10. Father Hand, of course. I'm so excited about the holidays. I have booked almost everything now - just need a campsite at Tahoe and a motel in Visalia for the first night. Rather than driving the 7 hours from Vegas to Sequoia and pitching the tent in the dark (because we wouldn't leave until the middle of the day, in spite of any good intentions we might have had), I decided we should drive 6 hours to a Visalia motel and then go into the national park nice and fresh the next day. That was a really pointless paragraph but I can't shut up about the whole scheme, it's too exciting! I'm also planning yarn store visits. Father Hand informed me (I can't remember if I said already) that an associate paid him for a job by giving him a car, which we can use for our trip - so all that money saved is now yarn money. Well...a bit of it, anyway. I'm most excited about finally getting to see Jimmy Beans in Reno, after several years of buying from them online and suffering the VAT/PO charges. Feeling much better, by the way, just still a bit twingey. I forgot! Bad girl. It's not like I even had going to work as an excuse - thought yesterday was the last day of marking. I finished my paltry allocation with a few hours to spare and was left to swoop in and do my backreading duties on a member of my team who left 700 essay questions for the last 24 hours. He finished 14 minutes before the deadline. I was awestruck. I quite like the online marking, even more as a team leader, because I can snoop on other people's progress and stats. I'm also glad I was team leader because I don't think I would have finished on time if I had had a normal allocation, whereas taking six days out in hospital didn't stop me from getting all my team leader stuff done, especially since most of it was having to be done at the start. The extra cash is not going to hurt, either! 1. Paratha. An Indian version of fried bread. I like how it breaks up in circles. 2. Tandoori chicken. I don't much like really sloppy curries, so the dry chicken is perfect. 3. Chana Massala. I'm a sucker for the humble chick pea. I have to mix this with rice because otherwise it's too saucy (see above), but it's really tasty and a portion will usually do two meals if I have it with the chicken. 4. Banana curry. I know, it sounds so, so wrong. My local curry house doesn't sell it, but I had it at the Christmas curry the Thursday knitting group went on last year and it is amazin'. Very coconutty and kind of sweet - could be eaten like a dessert. 5. Sag Aloo. I think I mean sag aloo - spicy potatoes and spinach. I make a mean version of this myself which is a Slimming World recipe, aka "No Guilt". In fact, I like my own so much I never order this anymore because I am disappointed when it's not as good as my own. I was a little concerned, after my op, that certain things might disagree with my stomach and last night was quite a big test, since I ate a big meal* and I had a fizzy drink. But I've been fine. Evidently I can go on as normal without my gall bladder - I was worried I'd end up unable to eat cheese or fat or chocolate or something. Come to think of it, I haven't had any cake yet - now THAT would be tragic. * Interestingly, since having the op, my appetite has shrunk. Maybe it's because I didn't eat for so many days, or maybe it's because I'm being a bit more thoughtful. Last night I ordered the same amount of curry things as usual and half of my meal is sitting downstairs in the fridge waiting to become lunch. Normally there are just the chickpeas and some rice left which I hoover up for breakfast....no, I have no shame. Fave Fridays is from Kelli's Blog - she has a great deal of stuff on it so it's definitely worth a look. This year, for the first time ever, I have grown something edible in the garden that isn't a tomato. This monster is a courgette which cost me 50p at a school plant sale. It had one yellow flower and one leaf, and now it's so mahoosive that it's attempting to devour the tomato plant sharing its planter. The thing moves with the sun, too. I can't believe how big it is. It is already courgetting. How exciting! I get all these courgettes to myself because Mr Z is not a fan. I didn't used to be a fan until I realised how versatile they are. And today I cooked with one I'd grown for the very first time and realised exactly how tasty and juicy a real fresh courgette is. They will be back in the garden next year, definitely. All the time I was in hospital, while I can't say I was hungry, I did think about food A LOT - I love eating and not being able to indulge was torturous. I put my mind to thinking up ways I could cook my courgettes. Here's my recipe for this week - I made it today, with all local ingredients rustled up from the fridge and the veggie drawer. Grate the potato and the courgette. Squeeze in a colander for a little while to get rid of the excess moisture. Season well and stir in the beaten egg. Heat a frying pan with some spray oil in it and press handfuls of the mixture into cakes. Fry on a lowish heat for about 5 minutes each side - until the potato is cooked. Sprinkle with cheese for the last couple of minutes. I had these with some onion marmalade I also had in the fridge and they were delicious - a really good lunch. I didn't take a picture...because I was foolish, and added the cheese to the potato and courgette before cooking, and so it sort of stuck to the pan and didn't look great. Blush. But it tasted delicious! And there are three more courgettes waiting for the chance to be rostified tomorrow, so there might be a picture yet. Oh...for the purposes of American readers (since OLS is an American invention) I think maybe you call courgettes zucchini? We call them courgettes when they're little and marrows when they get really big. The surgery took place on Monday. The surgeon seemed to think the gallstone which was stuck in my bile duct had passed, since I was no longer the colour of a Simpson. I was dubious, since I still hadn't eaten anything and thought that might have more to do with my healthier appearance. When they went in, it turned out the stone hadn't passed, and it took three and a half hours (instead of less than one) to scrape out my pulsating, swollen, inflamed gall bladder and fish out that nasty stone which had been preventing me from eating for the best part of a week. Mr Z rang the hospital at 10 to hear that I'd gone in and should be out by 12. In the end I finally got back to my ward around 4pm, by which point he was fairly frantic, having been there for four hours without any updates from the ward staff. Snaps to him for keeping his cool, because I would have hit the roof if the positions had been reversed. I spent the evening sketching out on morphine and heroically refused more painkillers when I finally regained lucidity, a decision I regretted by morning, by which point I felt so sore that I thought I would never feel right again. That passed quickly, though. A shower and an ice lolly (and the pain pills, natch) later and I was already well on the road to recovery. Tuesday night was a bit of a shocker, though. The heat was unbearable; there was a nightlight right above my bed (so I ended up actually sleeping on the side which had been operated on in an attempt to block out the brightness); two other patients had just come back from surgery so the nursing staff were clattering around them every couple of hours; I was in pain lying down and couldn't tilt my bed up because it was about a century old and didn't have a remote control thingie; and smell? Poor old Joyce in the next bed took care of that. Bless her, they gave her a senna capsule and, as I lay there in the dark, I'd hear, "Oh no! Oh no!" followed by some very lavatorial noises; and then her alert light would go on and the nurses would come and change her, and the bed. This happened 3 times. When the doctor finally said I could go home on Wednesday (after making me wait four hours) I nearly wept. I couldn't get out quick enough. I am feeling OK now, as long as I keep nice and still - perfect for marking. I can eat again, and I lost 12lbs throughout the incident. I'm excited to think that I never have to go through that pain again. The nursing staff were amazing - just so helpful and patient. The woman in the bed opposite had me grinding my teeth within half an hour of being put on the ward but they kept their cool with her, and were completely unruffled and unperturbed throughout my entire stay. One even went and made me a sandwich with ham she'd run down to the canteen to get, when I said I wouldn't eat a hot meal for lunch. They absolutely keep that place running - I could count on the fingers of both hands the number of minutes I spent talking to doctors during my stay; my consultant didn't even come back to discharge me: he sent a junior doc who wasn't allowed to do it and had to ring him to confirm! But the nurses were stars (and the first doctor I saw - she was also quite good). Perhaps I should send them something. Here endeth the tale of the gall bladder. It is gone; it cannot grow back. There does not seem to have been an impact on my digestion, that I can tell as yet. And really, it ended up being quite well timed, since now it won't interfere with my holiday, and it's a very quiet time at work. Typically, my school won at the conference I'd spent all year setting up. That was the only bad thing about the timing, really.